I don’t know about you, but I’ve never heard Mike Tyson talk about potential 1990’s rival and fellow former heavyweight king George Foreman. Never once. Maybe, just maybe, this is because at no time did “Iron Mike” want anything to do with the old warrior he is famously alleged to have referred to as “that animal” when telling Don King what he could do with his lucrative idea of fighting Foreman. Maybe not. Still, to me, and millions of other fight fans, Foreman-Tyson, Tyson-Foreman is the ultimate Dream Fight; one that was tantalizingly close in 1990. The two greats fought on the same bill in June of 1990 – Foreman taking out Adilson Rodrigues in quick time, Tyson rubbing out Henry Tillman ever faster – and the idea being floated around then was for the two to engage in another double-header that September (Tyson Vs. Alex Stewart, Foreman Vs. Francesco Damiani) and then meet in a blockbuster in December. Talk about the heavyweight explosions of heavyweight explosions! Following on from my recalling of the classic Foreman Vs. Holyfield fight from 1991, and the interest it generated among ESB readers, I give here my interpretation of what would have happened had Big George met “Iron” Mike Tyson a year earlier, as originally planned. Who knows, if Foreman and Tyson had met in late 1990, a fight between George and Evander might never have happened. For what it’s worth, this is what I think would have occurred had Tyson and Foreman tangled in the first year of the decade that was the ‘90’s. The date is June, 1990, and two former heavyweight champions of the world, George Foreman and Mike Tyson, have both recently appeared together on the same bill for the first time ever. The ultimate idea, however, is that after one more double header together the two will fight each other – the young tiger trying to get his title back, fighting an elimination bout with the old lion trying to do likewise. This is a fight everyone is talking about, and as pretty much an even match at that. What with Mike’s aura of invincibility removed due to his drubbing at the hands of Buster Douglas and Foreman’s new-found respect at the age of forty-one, the fight is now seen as a genuinely intriguing one. One that either guy may win. The fight is held at Caesars Palace in Las Vegas on December the 8th, and a sell-out crowd is in attendance. There is not a seat to be had, nor has there been one for some weeks. The fight caught fire with fight fans everywhere and as a result turned into box office gold. Many celebrities are sitting ringside also, as they too are burning with excitement-filled curiosity as to what will happen when the old slugger collides with the young banger. The atmosphere is positively electric as the two fighters make their way towards the ring. George Foreman makes his entrance first. Wearing the same shorts he wore when he fought as world champion back in the early 1970’s, George is led through the arena by his handlers. Amongst these handlers is the legendary Archie Moore, a man who knows all about how to fight successfully as an old man. Also present is knowledgeable Foreman regular Charlie Shipes. The cheers are deafening as George squeezes his huge frame through the ropes and bounces across the canvas. Then Mike Tyson appears. Once more disdaining any unnecessary ring apparel – content instead with shorts, boots and gloves only – Mike is led in by his team. Though he has no-one as wise and as experienced as either Archie or Charlie among his corner-men, Mike is confident in the abilities of his new trainer, Richie Giachetti. There are cheers too as “Iron Mike” enters the ring, but a sprinkling of boos is also heard. It is clear who’s side the majority of fans are on. The great Chuck Hull does the intros as only he can and the stage is set. With the winner set to face the new heavyweight ruler Evander Holyfield, the most intriguing heavyweight clash in recent memory is also one that will decide which of the two men will see their hopes of fighting to regain their old title come to fruition. Lose tonight and it could all be over. Quite simply, there couldn’t be more at stake. Round one. The first bell is still an echo when Tyson comes thrashing out of his corner. He immediately opens up on George and cracks the old champ with a hard right. George instinctively holds and uses his massive strength to tie Tyson up. Referee Mills lane breaks the two huge punchers and Tyson looks to get back inside. Foreman, his timing upset by Mike’s incredible speed, cannot get his jab working and consequently has no weapon with which to keep his raging opponent at bay. Two wicked shots, a left hook and a right uppercut, crack Foreman’s jaw but amazingly he doesn’t go down. With the crowd making a deafening amount of noise, George again instinctively reaches out and grabs at Tyson, buying precious seconds while his head clears. Any doubts some may have had about the quality of George’s chin while boxing as a veteran have already proven to be completely unfounded. The question is, can he possibly carry on taking such punches? With less than a minute to go in the round, after more hard work done by Lane in prying the two big guys apart, Foreman at last scores with a decent blow. A hard right hand to Mike’s midsection, that lands as Tyson advances, momentarily slows him down. But then Foreman is back on the receiving end as his young rival lets loose with a blinding combination. A whistling left hook upstairs just misses Foreman’s head, while two follow-up right hands connect. George, his chin tested more so than at any other time since the legendary 1976 Ron Lyle fight, staggers badly and looks a dead-cert for the canvas. Instead, he stumbles into the ropes and remains upright to hear the bell. Already, it looks as though nothing but a bad beating lays in store for old George. Despite the lack of a knockdown, Tyson wins the round 10-8 on all three judges cards. Between rounds George stands in his corner, as has been his habit during his comeback. Shipes tells him to get his jab pumping out and to time Tyson’s rushes. On the other side of the ring Tyson sits and snarls. He did not want to hear that bell. Giachetti tells him more of the same. Round two. Foreman’s hands are noticeably higher now and he has a different look on his face, and not just because his eyes are showing signs of swelling. Fully aware of just how hard Tyson can hit him, “The Punching Preacher” now braces himself. Tyson works his way inside once more, yet curiously he doesn’t let go with the same fast punches he did in round one when he gets there. Not right away anyway. Not as physically strong as Foreman when it comes to the wrestling, Mike waits for the ref to part them and, as Mills does so, he unloads with three viscous punches on the break. Before Lane can get in to admonish Tyson, however, George retaliates, almost blindly, with a monstrous right hand. Shockingly, Tyson is wobbled by the massive punch. The crowd is now screaming itself hoarse! How can Foreman be doing what he’s doing? He has taken Mike Tyson’s best punches, three of them mere seconds ago, and yet he’s come back to shake “Iron Mike.” Now, for the first time, Tyson knows he’s got a fight on his hands and the easy win that only a minute or so earlier had looked right on the cards for him, has vanished. Regrouping following the hurtful punch, it is now Mike’s turn to wear a thoughtful look. He weaves his way inside, and lands with two hard shots to Foreman’s body. As he does so, George shoves him off him, and then blasts his head upwards with an uppercut somehow retrieved from the 1970’s. Tyson is rocked on his heels and George forces himself forwards to follow up. He misses with a sweeping left but catches the groggy Tyson with a right to the temple. Tyson crashes to the floor! The scream can be heard all over Las Vegas. Mills lane rushes in and begins counting, he himself seems utterly bewildered at what has happened. The count reaches five and Tyson climbs to his feet. George now advances and, with astonishing calmness, cranks out four slow but perfectly accurate sledgehammers to Mike’s head and jaw. The final punch, a right to the very point of the chin, sends Tyson to his knees. Again George is sent to a neutral corner and again he rests his arms along the top rope as he stands in a cross-legged stance while watching his opponent attempt to rise. This time though, he cannot – at least not in time. For Tyson is counted out in the act of rising. 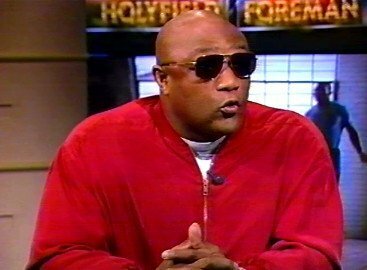 George Foreman, who tosses a wink at commentators Larry Merchant, Jim Lampley and his old trainer Gil Clancey, is the winner at two minutes and fourteen seconds of round number two. Just as the late, great Cus D’ Amato once told the teenage Mike Tyson; a short, swarming pressure fighter such as he could never hope to defeat a George Foreman. You are here: Home / Boxing History / Foreman Vs. Tyson: The Heavyweight Explosion Of Heavyweight Explosions!